This is for all my friends out there who, like me, adore goat cheese. You're welcome. Originally, I wanted to make these tartines with fresh mission figs. It was only about a year ago when I had my very first taste of fresh fig. I know, I know, how could that be?! Well, growing up there were always Fig Newtons at my Grandmother's house. She loved(and still does) them, but I was never really a fan. I guess I figured fresh figs would taste the same. Wow, was I wrong. While living in Atlanta, I noticed two large mission fig trees growing near my urban vegetable garden in our apartment complex. Being a lover of all things food(especially free food) I gave a stab at trying one fresh off the tree. Wow. I picked a handful, brought them back to my apartment and made roasted figs with goat cheese, and prosciutto. Even wow-er. Okay, so now I like figs. So today I went looking for some fresh mission figs at the supermarket, but could only find dried Turkish figs. I figured I could improvise. I saved the left over duck fat from last night's magret de canard(duck breast) that Quentin so deliciously cooked for us, and spent most of the night brainstorming on how I could use it. I thought to myself, "Figs go well with goat cheese, goat cheese goes well with caramelized onions, onions + duck fat = yum, and duck goes well with fig." Slice the dried figs in half and place in a small bowl. Pour boiling water over the figs until just covered, and let steep for 10-15 minutes. In a medium-sized sauté pan or frying pan, heat a tablespoon of duck fat on medium-high heat. 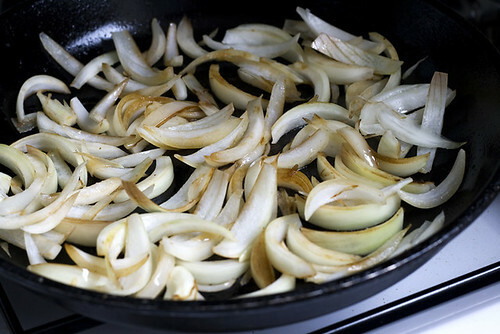 Once heated, add the onions and stir to coat the onions with fat. 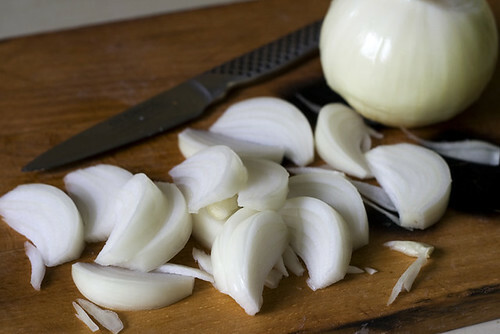 Spread the onions out evenly over the pan and reduce heat to medium. Stir every 10 minutes or so, until the onions are softened and brown. This will take about 30 to 45 minutes. Remove figs from the hot water(save the water) and scoop out the seeds and pulp with a spoon. In a small saucepan, add the fig seeds and pulp, balsamic vinegar, honey, 1/3 cup of the water the figs were steeping in, and a pinch of salt. Stir to combine. Bring to a boil and then simmer for 5-10 minutes, until thickened. 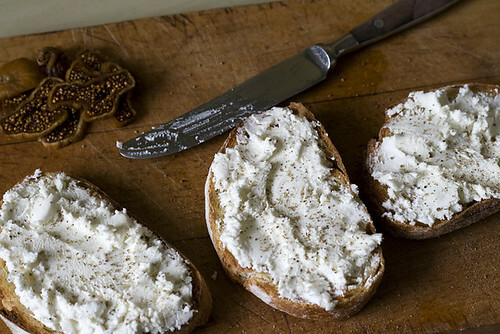 Spread fresh goat's cheese on toasts and top with freshly cracked black pepper. 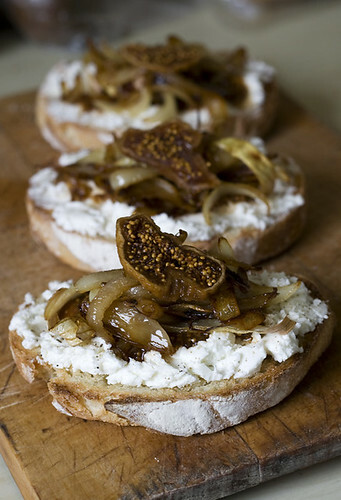 Spoon balsamic fig reduction over the goat cheese and top with caramelized onions. Add a little slice of dried fig to the top for presentation. Serves 2. Yum! 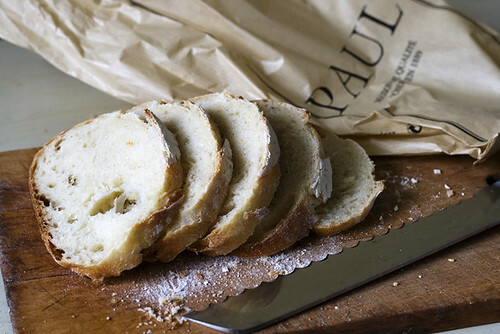 Yes this combination is a classic and for good reason...it's so delicious. Though I do prefer a fresh fig to a dried fig...a girl's gotta do what a girl's gotta do right? Love this recipe. We eat goat cheese at least once a week, so I'm adding this to the list! Oh I would rather fresh figs than dried any day also... and of course I went to the grocery store today and they had some. Oh well, it was still tasty! Thanks everyone!